Clockwise, from left: "Those Ones" (collaboration), "One With Goatman" (collaboration) and "Yola" (Cole). Collaboration: If it were easy, everyone would do it (and do it well). The concept is revered in education, business and government, yet some professions would seem to be antithetical to collaboration. Artists, for example, tend to work alone, which is what Melissa Cole and Ric Gendron have done for decades. They've built separate, successful careers and a loyal following with exhibitions ranging from boutique galleries to contemporary venues such as the Art Spirit Gallery in Coeur d'Alene. Their work is as familiar as Cole's "River Dance" in the Spokane Convention Center and Gendron's vibrant paintings of musicians outside Hotel Ruby in downtown Spokane. Yet something powerful can be unleashed when two artists share not only exhibition space, but also the same canvas. Life | Stories at the Northwest Museum of Art and Culture includes works by each artist, as well as something not often seen in the visual arts: artwork in which both artists fully participate, exchanging a single canvas back and forth to create something greater than its parts. "It is unusual to see collaboration in two-dimensional, canvas form," says MAC Director Wesley Jessup. "[Cole and Gendron] share an energy that is based on color and imaginative interpretations of familiar figures and forms." Cole and Gendron had known of each other for nearly two decades, traveling in similar circles the way many regional artists do, seeing each other during ArtWalk, participating in the same events like ArtFest. In that time, they had developed an appreciation for each other's work. "I liked the outlines and the energy [Ric's work] had," says Cole. "And I liked that it wasn't all just Native work. It had a lot of musicians, and weird-looking people, and animals." Gendron remembers the Cole painting that first grabbed his attention: a Native American dancer — the only Native subject matter Cole has ever rendered — who happened to be a friend of his. They didn't meet, however, until 2001, when both were working on a River Park Square mural. Over the course of a week, they realized some commonalities, like their intense need to be in the studio. "I feel like I have to do it because I just need to create," says Cole. Because she travels so much, says Cole — Mexico, France, the Galapagos Islands and Ecuador, among other places — she is antsy to get back in the studio with a brain full of images and ideas from her travels. Gendron, who jokes that he doesn't go anywhere, shares a similar compulsion, painting every day when possible. He doesn't think about working or creating all that much, he says; he just does it. "It's like what Chuck Close says: 'Inspiration is for amateurs.'" 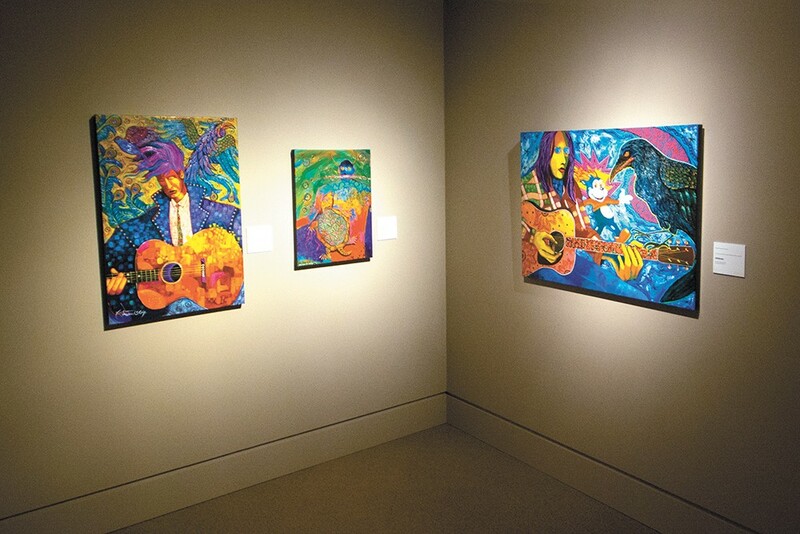 Laura Bracken, principal at Design Spike in Spokane, has several works by each artist. "It is the richness and textures of the paintings that draws me in and lets me sit with their works," says Bracken. "In fact, each time I sit with Melissa's crow or her bright red robins, I see lights and reflections in the beads and glass that I hadn't seen before. 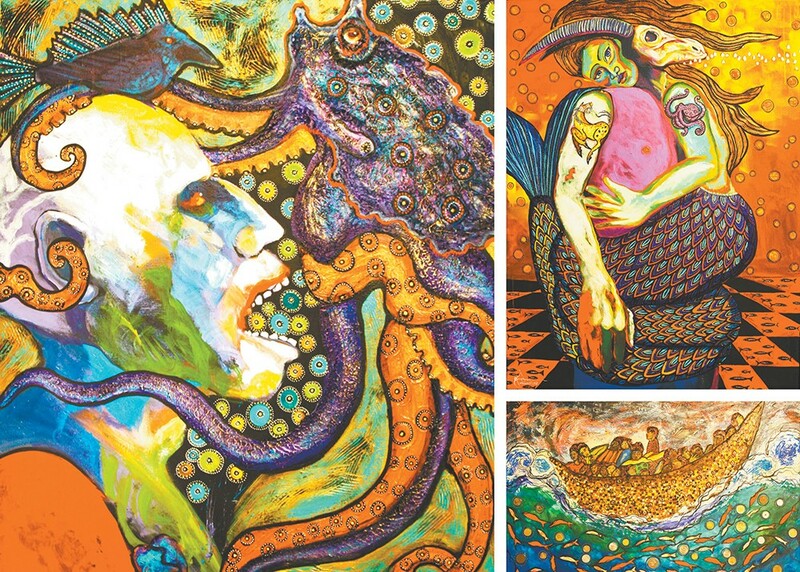 Ric's "Sun" and "Dreaming Man" show the complexities of the Native soul. Having pieces of original art from these painters is a gift they gave to me." Collaborative pieces by Ric Gendron and Melissa Cole. Although both artists are known for their use of color and are strongly influenced by family and culture, it manifests in different ways. Cole, who is Asian Indian, graduated with a degree in zoology and marine ecology and eventually launched an art career influenced by her upbringing in India and other international locales. Her mother's vocation as an artist and her husband's work as an underwater wildlife photographer also inform her work, recognizable for its strong patterning, vibrant colors, and tendency towards flora and fauna, particularly marine life. "Fall Fortune," for example, is a large canvas teeming with koi fish against a luscious green background, all of it richly patterned. "Rabbit Hole," however, features three-dimensional doors containing objects and is a new direction for Cole, who has moved from heavily textured surfaces to incorporating glass and other flat accents into her work to working with more three-dimensional forms. Gendron, a dual-enrolled member of the Arrow Lakes Band of Confederated Tribes of the Colville and Confederated Tribes of the Umatilla, grew up in a large, musical family who encouraged his artistic and musical pursuits. His academic background includes Spokane Falls Community College and Cornish College of the Arts, yet his work is often shaped by pop culture, music, literature and history, and tends to have more narrative and occasional political overtones. Gendron's "Standing Rock," for example, is an obvious reference to the 2016 opposition to the Dakota Access Pipeline led by the Standing Rock Sioux tribe, who were joined by indigenous peoples nationwide. "Medicine Lodge," however, includes strong patterning, similar to how Cole works, and the pair admit that they sometimes influence each other. "I just really love his figurative work," says Cole, who has been incorporating more people into her work, such as in "Jaipur Market" and "Yola." "We aren't competitive together; we learn from each other, and that's really hard to find," says Cole. "He's one of the only people around the art world in Spokane that I can talk to about the business and people in it." That level of trust and respect enabled the two artists to broach the idea of collaborating on a shared canvas, which they did for a 2015 exhibition at Radius Gallery in Missoula. Gendron was apprehensive at first. "I was kind of a little inhibited to actually start making marks on Melissa's paintings, but then after a while I thought, 'What the hell?'" They're having fun with the process and have embraced the idea that they won't know what will happen with each piece, says Cole. "Take These Broken Wings and Learn to Fly," for example, features recognizable elements from both artists: Gendron's depiction of a man playing guitar, and Cole's birds. Some collaborative works are more jarring, like "Turtle Head" or "Smoked Salmon," both of which employ unusual compositional devices and potent color to fairly buzz within their canvas frames. "One With Goatman" is the largest and the most harmonious work, depicting a heavily patterned, mermaid-like figure entwined with and merging into a figure with exaggerated arms and a goat-like skull.